my little red suitcase: The freedom to roam! Aren't they just beautiful!....and so powerful too! I was driving my car across the common. 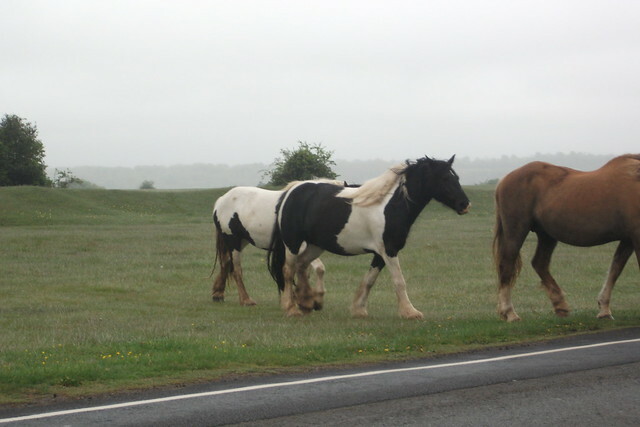 I stopped as I could see the horses coming and knew they would cross the road. Magnificent and on a mission, they knew where they were going. Horses have right of way here, and cows too. Sometimes there's a little donkey following along. He tends to hang out with the horses! 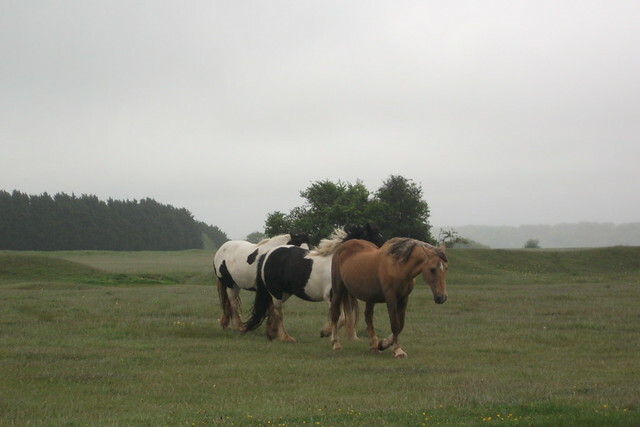 These horses aren't wild, but between mid may and October they are allowed to roam and graze here on the common, along with about 400 cows. 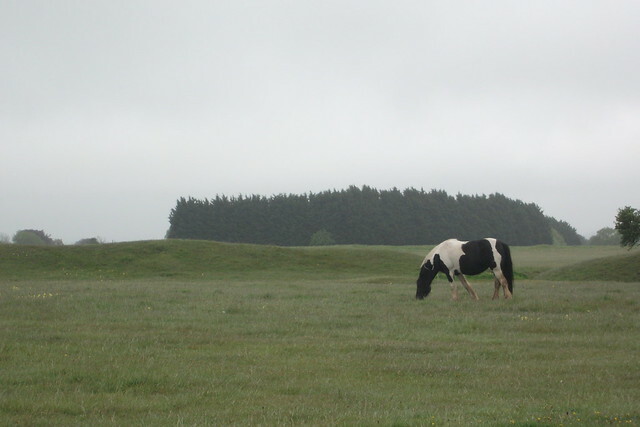 The ancient grazing rights go back to William the conqueror. In the surrounding area there are signs telling drivers 'the cows are out', and to take care driving across the common. Over the first few days the young heifer cows were following and learning from the older ones. At first you would see a line of young cows standing at the edge of the road wondering what to do. Then suddenly one will break ranks, so you have drive slowly and be ready to stop. Sometimes they will cross on mass and the traffic just has to wait! It can get busy up here, what with the cattle and the cars. There are also lots of dog-walkers. I just walk through the cows, as if it's a normal thing and my little dog follows along. I know not to walk between a mother and it's young, and walk round wide if any of them are stamping their feet and looking erratic! There's also a golf course and some days it's so funny to watch the cows wandering up and down the golf course. They like to go and stand by the flag and have a scratch on the pole. Often leaving behind a gift for the men who look after the golf course! I do love this place, with all its strange customs. Hi There, Such ancient history!! !Love it!! !The horses are beautiful and they look so happy!! !It must be great to walk there with your little dog!!! Have a great weekend!!! Great photographs of the horses! Sounds like it's very boring here by comparison! I worry about them too! there are lots of road signs up warning people, so hopefully the drivers will slow down and take care, especially at night. Such gorgeous photos Heather! 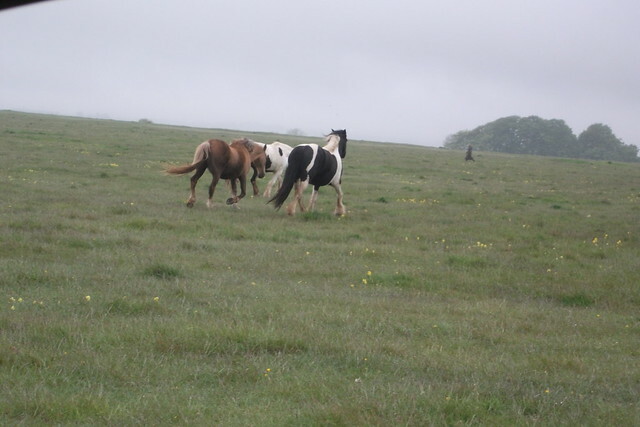 What a lovely spot for the horses to roam & I loved reading about ancient grazing rights - fantastic. Wild turkeys can slow traffic way down and the occasional bear lumbering up from our beach is a disconcerting sight. In the fall, before hibernation and again in the spring when they wake up, our bird feeders and anything they are attached to can suffer from their attempts to get at the seed. The geese are teaching their young lake etiquette and flowers are blooming like mad. All this only about 30 miles from Boston! I love living here.